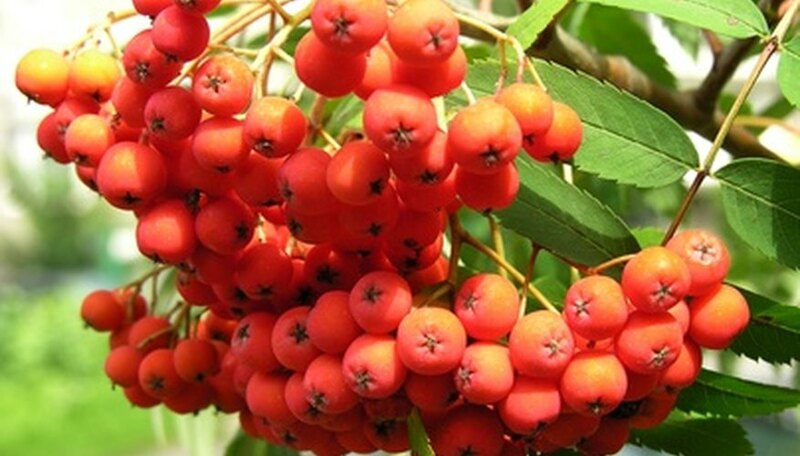 The rowan tree (Sorbus aucuparia), commonly called the "mountain ash," grows native in the British Isles. In the United States the tree is grown as an ornamental. Rowan trees grow 30 feet in height with a rounding canopy growth habit. In the spring, white flowers cover the tree and bright orange-red fruit appear by midsummer. Numerous new cultivars offer diverse berry colors in pink, red and yellow. Fruit grows in large clusters of 40 or more berries. The rowan tree belongs to the same family of plants as the rose bush, the Rosaceae. The tree grows native throughout Britain, North Africa, Europe and Ireland. In North America the rowan tree is considered to be invasive in many states. The rowan tree grows well in slightly moist acidic soil. It prefers full sunlight but will tolerate partial shade. The tree does grow well in standing water or flooded locations. The tree is hardy in U.S. Department of Agriculture zones 3 to 6. The foliage of the rowan tree appears pinnately compound with up to 15 tiny leaflets. The long pinnate leaves measure up to 9 inches in length with each tiny leaflet measuring 2 inches in length. During the fall months the tree turns yellow, red and orange. The rowan tree does not naturally grow as a single trunk. It must be trained and pruned to maintain its trunk or it will be a multistemmed tree over time. Seeds are not produced until the rowan tree reaches 15 years of age. Birds adore the fruit of the rowan tree. They flock to consume it as it ripens and then widely disperse the seeds through their droppings. The fruit rarely lasts on the tree into the winter months. The seed requires cold stratification to crack its hard outer shell in order for germination to begin in the spring. Germination occurs in the first or second year after the seeds are dropped. The tree easily lives up to 100 years.